Minebea Mitsumi Inc. is a diversified global manufacturing and technology company. Minebea Mitsumi Inc. offers a wide range of products in the automotive, home appliances, industrial, aerospace, medical and consumer markets. In July 1951, Minebea was founded in Tokyo’s Itabashi Ward as Japan’s first manufacturer specializing in miniature ball bearings. The company was formed after the war by engineers from the former Manchuria Aircraft Company upon their return to Japan from Manchuria, and their dreams and passion were focused on the growth of the aircraft industry. In the chaotic Postwar period, they struggled like everyone else at the time to build the foundations of their business. Today, more than 60 years later, the company is recognized widely for its engineering capabilities and management excellence, Minebea Mitsumi Inc. includes facilities in 16 countries around the world with over 105000 employees. 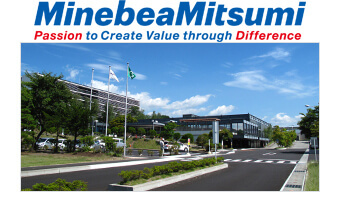 Minebea Mitsumi Inc. provides the world with products that are essential to everyday life, from ball bearings to machined components, rotary components, electronic devices, measuring components and more.